After the Nokia Lumia 800 just became available through TELUS on March 2nd, you can now get it on sale for $24.99 (w/ 3 year term and any $50 plan) through TELUS in Canada. Original price without the sale is $224.99, that’s a lot of money saved! The sale ends March 31, 2012 and based on the TELUS order page, all three colors – cyan, magenta, black – are available at the sale price. 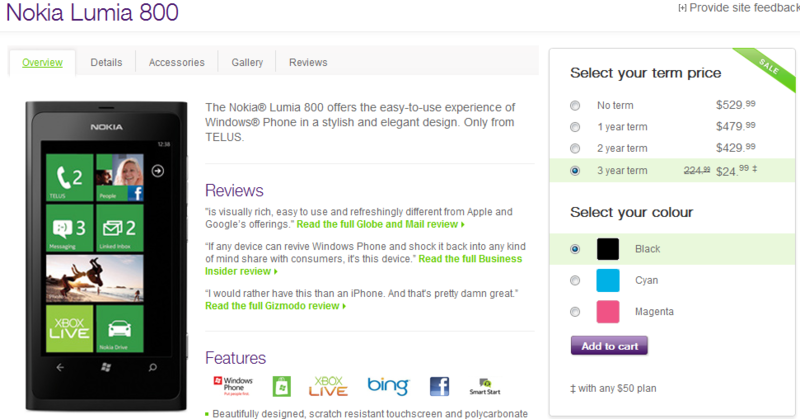 If you forgot all about the Nokia Lumia 800 coming to TELUS back on March 2nd, and prefer no contract, you can get it for $529.99. Get on it Canada folks!